Well, it looks unlikely that Mr B's shirt will be ready for our anniversary (in five days' time). Fortunately for me he is very understanding about these things. 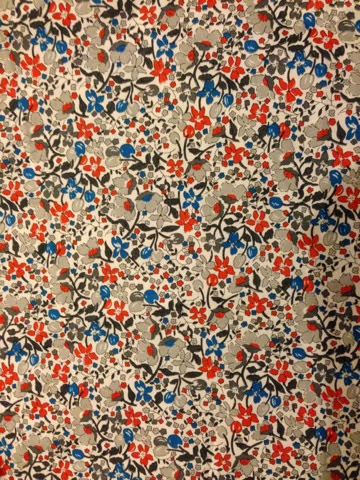 I have got the fabric, a Liberty Tana Lawn called Coward - I'm a bit sad about the name - was hoping for something a bit more romantic! 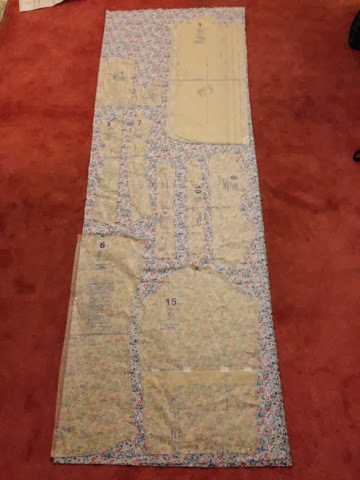 I wasn't sure how much to get as no yardage is given for 135cm wide. So I settled on 2m in the end and it has all fitted in just fine. I'm not sure why the given pattern layouts say to cut most of the pieces separately (rather than in layers) I guess I'll find out if I should have done that later on! Just out of interest I'm timing how long it takes to make this shirt. One hour 15 minutes so far. I had to shorten the sleeve by two inches. I was wondering if my husband had super short arms but when I checked against his shirts it turns out that this shortened length matches what's in his wardrobe. "Maybe Vogue are designing for gorillas?" Said he. By the way, I've written this on my phone. How amazing!